The yuletide season is not yet over! As we welcome the new year, a great news from one of the leading mobile brands has been announced and has already started! 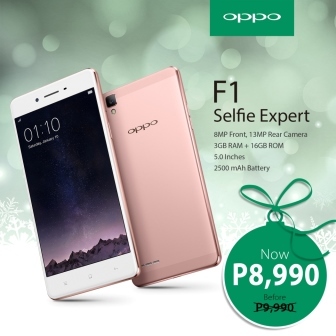 Heads up, Christmas shoppers: there’s another P1,000 off on the OPPO F1 starting on December 9.The discount applies to OPPO’s P9,990 holiday promo on the F1, further dropping the price to a mere P8,990.